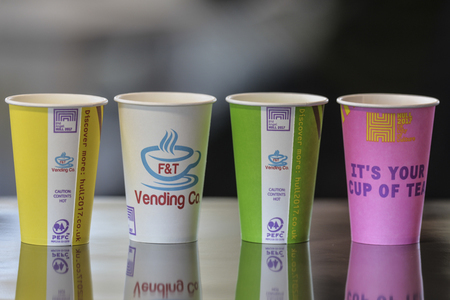 UK-based Benders Papers Cups has developed new coffee cups for Falkingham & Taylor (Vending). The new cups, which will feature Programme for the Endorsement of Forest Certification (PEFC UK) certification label, have been developed to mark the occasion of Hull City of Culture 2017event. Falkingham & Taylor (Vending) provides services for customers in sectors, including; heavy industrial, manufacturing, food manufacturing, local government, leisure, education, retail, office, pubs, clubs and café bars. The special City of Culture 2017 coffee cups feature PEFC’s “two trees” label. This assures that the materials used in commemorative certified cups have been both responsibly and sustainably sourced. Benders Paper Cups is engaged in manufacturing paper hot cups. It produces all of its at its BRC/IOP AA Grade factory in Wrexham, North Wales. Recently, paper bag manufacturer AB Group Packaging has introduced a heavyweight paper bag at the Packaging Innovations 2017 event held in Birmingham, UK. Certified by Programme for the Endorsement of Forest certification (PEFC), the 100% recyclable paper bag have soft hold handles and can be supplied with a colored handle option. Made using more durable, than standard papers, the paper bags feature unique ultra-strong quality, allowing it to carry up to 37lbs in weight. Forest certification system, PEFC has certified more than 300 million hectares of forests to PEFC’s internationally recognized Sustainability Benchmarks. Image: Benders Papers Cups’ newly designed coffee cups. Photo: courtesy of PEFC UK Limited.